One of the biggest reasons your immersion breaks in VR is a lack of feeling. If you're playing a game and get hit, or if you bump into a wall, you feel nothing (unless it's your real living room wall, of course). That throws off your brain, which believes, visually and audibly, that it's in a whole different world. 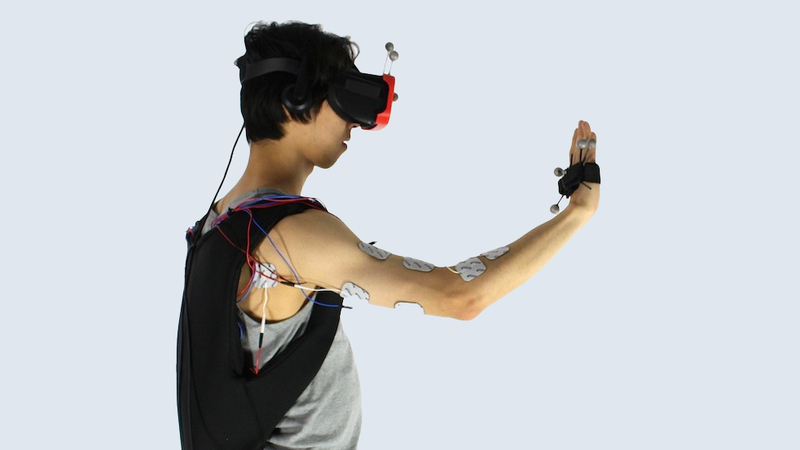 Researcher Pedro Lopes and his team, Patrick Baudisch, Sijing You, Lung-Pan Cheng and Sebastian Marwecki at the Hasso Plattner Institute in Potsdam, Germany, might have found a solution: electrically stimulate your muscles so you feel what's happening in VR. They've created a wearable that sends small electric shocks to your muscles. Specifically, it sends electric shocks to your opposing muscles. So, if you're pushing a block in VR, it'll send shocks to muscles that make it feel like you're pushing something. The entire rig has eight electrodes attached to the bicep, tricep, forearm and shoulder of each arm. Those are connected to a muscle stimulator, which is connected to a laptop running a VR simulator in a backpack. Electrically-stimulated muscle technology isn't exactly a world-changing breakthrough. It's been used by physical therapists for a while, and Lopes has been toying with it for a couple years now, previously making a smaller version just for the upper arm. However, this new system works for the upper body. It also comes with refinements made after Lopes and his team found there were problems with the initial design. The original design featured stimulation that was too long and was too powerful. While onlookers could see that a person couldn't put their hand through a VR wall, the person in the VR world said it felt more like a magnet was pulling their hand back rather than touching a wall. Instead, the team opted to reduce the stimulation to shorter bursts and designed the walls to be less rigid. Lopes tells Fast Company that he imagines the tech could one way make its may to consumers in thin wireless sleeves that feature electrodes embedded in material. But that day, and the day for our fully immersive VR future, is a long way away.